The main BIOS boot order may need adjusting. If the EFI shell is before the RAID Card in the Boot order the system will never boot from the RAID system. 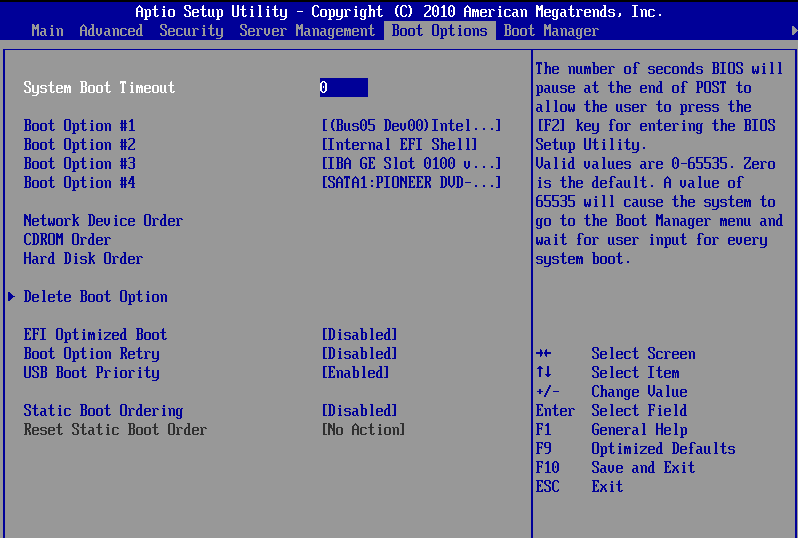 Check the BIOS boot order to ensure that the card is present and either at the top of the boot order list or near the top. RAID Virtual Drive Failure - Is the RAID system beeping, indicating a drive failure? Are any of the hot-swap drive bays marked with an amber LED, indicating a possible drive fault? Use the RAID Web BIOS to check the RAID health. All virtual drives should be marked as "Online". If a Virtual Drive has Failed you may need to try and put a failed disk back online, or rebuild RAID array. In this situation, please contact Stone for additional support. We will take you through a process to try and recover the situation, by marking any Failed (or "Unconfigured Bad") drives as good and then scanning the controller for disk configurations that it can import from failed drives (known as foreign configurations). This is a temporary measure to bring the RAID array back online until replacement disks can be fitted. Usually, the last disk to fail can be brought back online and re-integrated into a failed RAID array as long as the drive is still workable. If the last hard drive to fail is no longer detected, or cannot be brought back into the RAID configuration due to the number of defects or problems with the drive, then the RAID array has failed and the data will need to be restored from backups when the RAID array has been reconstructed. RAID Card Failure - do you see the RAID Card during the POST process? If you only see a system logo during the boot process you should check that the system's Quiet Boot feature is turned off to ensure that you can see POST messages. 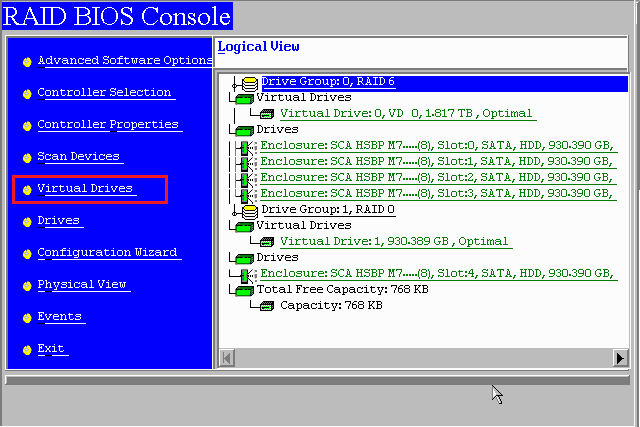 Is the correct Virtual drive set as the boot drive inside the RAID BIOS? 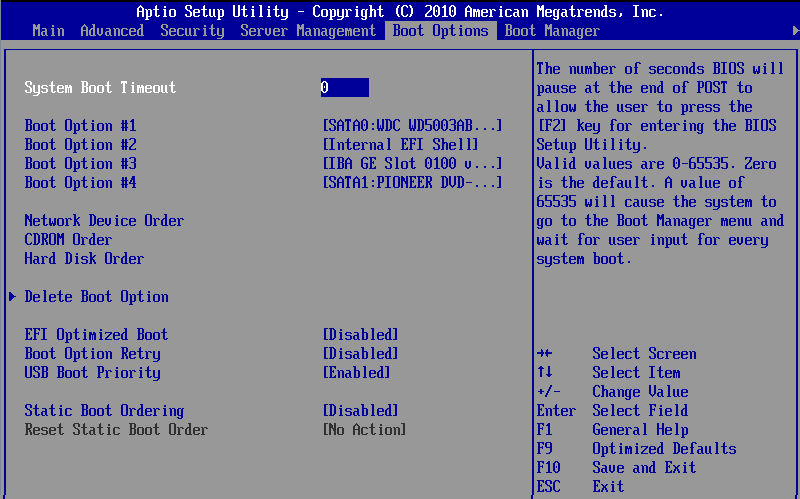 See Configuring the RAID Boot Volume. A hard drive may be on the verge of failure. The RAID card may be in the process of failing the physical drive. Check each physical drives media error and predictive failure statistics in the RAID BIOS (both numbers should be 0). If you suspect RAID volume corruption as the result of a failing drive, replace the drive and rebuild the array. A RAID consistency check may also help, but use this option with caution - on a RAID1 or RAID5 system with a problem disk, single RAID parity information may not be enough to guarantee repairing the data. If you have a RAID6 based system, usually a disk consistency check will be more reliable. All disk consistency checks will take a considerable amount of time based on the volume size, number of disks, and RAID level. Again, in this situation please contact Stone for further support. 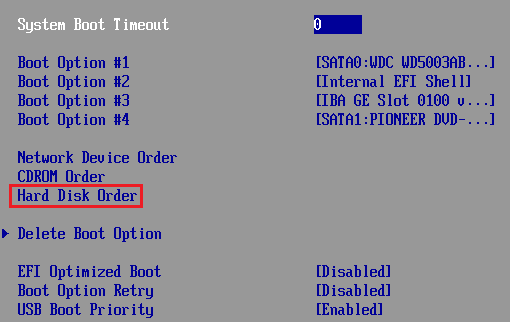 If the RAID volume is healthy, and the RAID card is in the correct place in the main BIOS boot order, and lastly the right virtual drive is set as the boot drive (or if you only have one volume) then disk corruption may be a possibility - if you recently experienced a system crash your Windows volumes may be corrupt. You may be able to boot from operating system installation media and run a CHKDSK /F on your Windows boot volume. If that does not help, you may need to perform a repair installation or restore from backups. Is the server warning symbol lit? It should be solid green during normal operating. If it is orange, contact Stone Support for assistance, and/or retrieve the hardware system event log (SEL). Are you trying to boot from a virtual drive that is 2TB in size, or larger? GPT partitioning has to be used to boot from a volume that is 2TB in size, or large. To boot from a GPT disk, you will need UEFI support or UEFI optimised boot enabled. In all situations please note any error messages or other symptoms and contact Stone support for further assistance. Tip: If you can't get into the BIOS at all using F2 - if the system remains stuck on the splash screen - you may well have a RAID card error message "hidden" in the background. The RAID card may be waiting for certain key-presses. To get around this, turn off the system, remove the RAID card from the system (noting any cable connection order), turn off quiet boot as above, then shut the system off again and re-fit the RAID card. Use this process to check that the main BIOS is attempting to boot from the RAID card, or to check that the RAID card is being identified by the system. If the RAID card does not appear as a boot option, the card may have failed, its BIOS may not be enabled, or more likely its virtual drive has failed meaning that the RAID card has no bootable device to present to the main BIOS. The instructions below are based on an Intel S5520HC system but are applicable to most modern Intel based server systems. Check the Boot Options, or Boot Devices, for the RAID card. 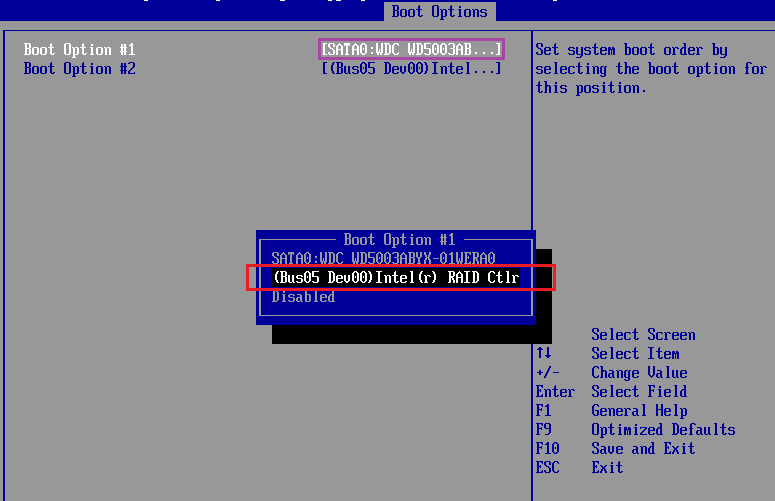 In the example below, the RAID card is not in the list of Boot Options and the system will not boot from it. From the Hard Disk order menu, see if the RAID Card is present. Look for an LSI or Intel device. 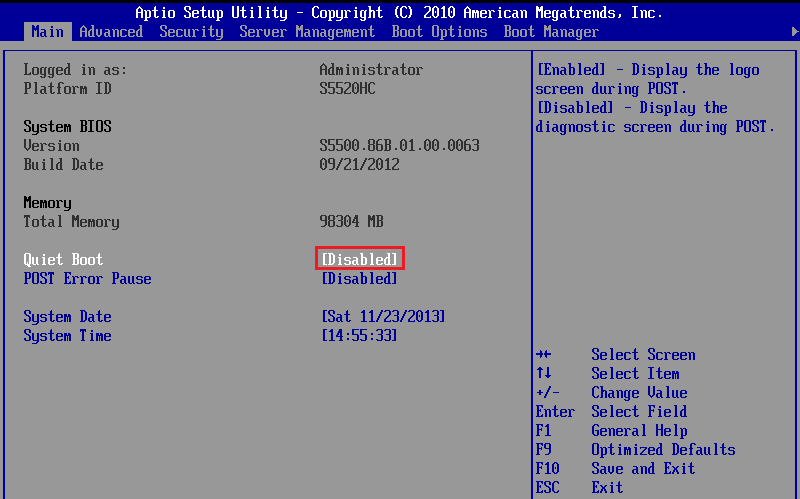 Either use the arrow keys to highlight the Intel / LSI device and then use the + or - keys to move the Intel device to the top, or press Enter on Boot Option #1 and then in the submenu that appears select the RAID controller as the first boot device by highlighting it with the arrow keys, and then press Enter again. Press ESC to return to the main Boot Options screen and confirm that the RAID controller is now shown in the list. Press F10 to accept the changes - you will be prompted to Save the changes and reboot the system. 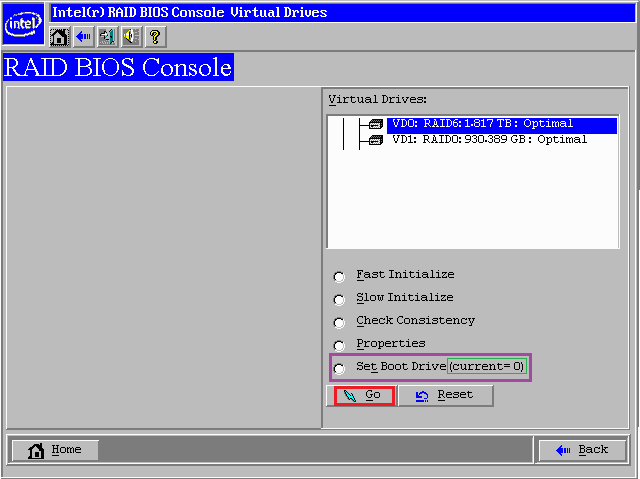 You can then see the current boot virtual drive. In most instances this is normally boot drive 0, or VD0, as this usually contains the operating system (although this can vary!). If you need to change the boot drive, click on "Set Boot Drive" and then click on Go.